A fantastic neoclassical style Italian cocktail table. 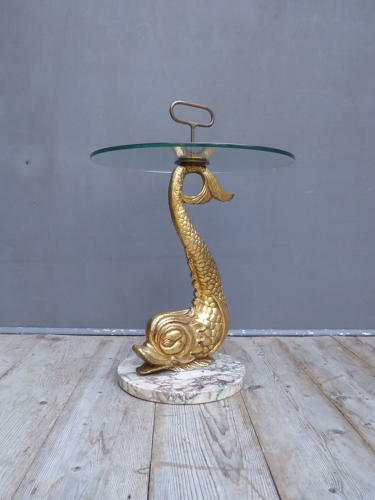 A stunning piece of mid 20th century Italian design, the solid marble base & gilt cast metal dolphin supporting a thick glass top finished with a brass handle. Unusual, super quality & so decorative! Wear commensurate with age, very good condition overall. Collection in person preferred, courier service a possibility, please enquire for details.